This wonderfully imaginative children's hardcover book by bestselling authors Gary Chapman and Rick Osborne, featuring four-color illustrations (with hidden details!) by Wilson Williams, Jr., will help children learn the importance of love. 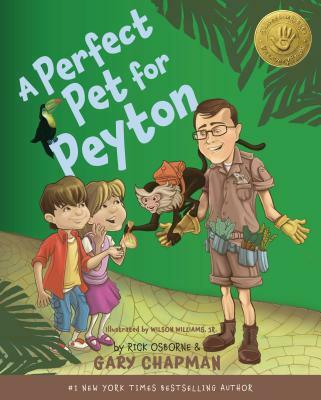 Based on Gary's highly successful The 5 Love Languages®, A Perfect Pet for Peyton tells an entertaining and playful story of five children who each, with the help of Mr. Chapman and the unique pets at his special emporium, discover their own personal love language. Children and parents alike will experience firsthand the power of the love languages as they cuddle up and spend precious time together reading this book over and over again. Peyton, one of the birthday celebrants, loves to help others, and appreciates it when others do little things for him. Penny, Peyton's twin sister, who receives love best when others spend quality time with her. Jayla, one of Penny's close friends, is always saying nice things about people. Her love language is words of affirmation. Kevin, one of Peyton's close friends, enjoys giving things to people. Sofia loves to pet the animals, and to show her love for others with special hugs.